Here's our FOXPRO Inferno Review! Are you looking for the best electronic coyote call in the $200 range with awesome volume, unmatched portability, and diverse features? Do you want the added guarantee of having a 3 year warranty, to protect your investment? How about great range? Would you balk if we told you this baby can be heard by human ears up to 700 yards away? The FOXPRO Inferno delivers true bang for your buck with its 1.5 lb portability, extreme volume and sound quality, and various features. It includes a diverse library of 75 FOXPRO calls, far greater than most electronic predator calls on the market. Its storage allows for up to 200 calls. 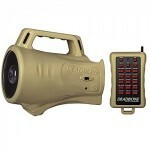 You can program this unit exactly how you like, and upload more than 100 of your favorite calls from the internet. FOXPRO has a great free sound library here. The Inferno is easily reprogrammable, with a USB port allowing you to link with your PC. 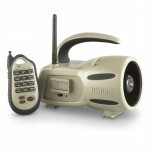 Storage capacity of 200 sounds, and includes 75 high quality FOXPRO calls. Included auxiliary speaker jack, in case you need additional volume. Most useful in snow, which notoriously muffles sound. Additional aux jack for linking with a FOXPRO decoy. Low Battery Alert; indicator light blinks when batteries are low on juice. Tripod mount at the base of the unit. Constructed in the USA; 3 year limited warranty. Ability to organize your sounds by call category (i.e. howls, distress calls, prey calls, etc). Custom function button -- assign a custom function to the Inferno's user button. 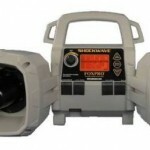 Why Buy the FOXPRO Inferno? Did you read the list above? This e-caller is loaded with awesome features; for $200, it's got everything you could possibly want. You won't find a better unit for the price. At only 1.5 lbs, you can take this electronic predator call anywhere - or you can put it in the back of your truck and forget it's there. With so many features and so much sound, we're not sure how they fit it all under 1.5 lbs. Field-tested for sound quality at over 600 yards, this unit is a true predator killer. 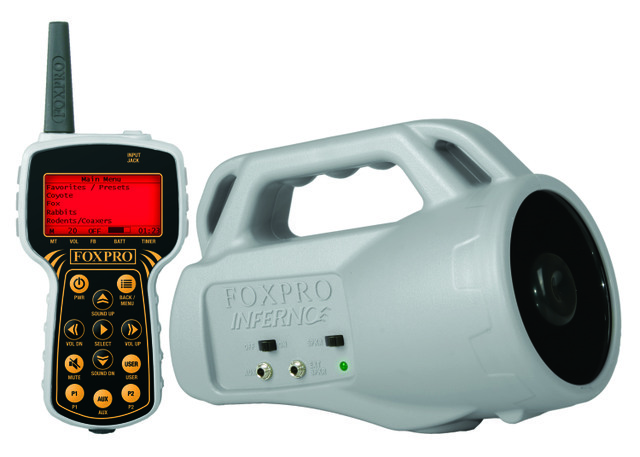 The FOXPRO Inferno is a true "bang for your buck" unit with its large sound library, ability to be custom programmed, and super-compact build. With its FOXBANG tech, the Inferno's remote control is a big step up from the Deadbone and the Turbo Dogg. 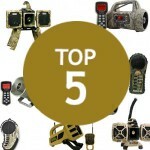 The remote's simple navigation options help hunters to switch between calls at whim. This allows you to keep your eyes on the field and therefore maximize your potential for a kill. The FOXPRO Inferno truly is an incredible value with its features, overall versatility, and new technology - and it includes a 3 year limited warranty.